Running with kids | Run. Work. Live. Repeat. Oops, I almost forgot! It’s May, not December, and today is Mother’s Day, although you wouldn’t know by the snowfall we are getting at the moment in Colorado! Luckily, I did most of my weekend running yesterday and not today. That’s when my kids and I did a local 5K together. It was their Mother’s Day gift to me. They know how much running means to me. My daughter running to the 5K turnaround at yesterday’s race. Don’t you just love it when things come together when you least expect it?! My kids and I had just picked up our race packets and were headed to our car to drop them off when we ran into my friend Becky and her two boys. 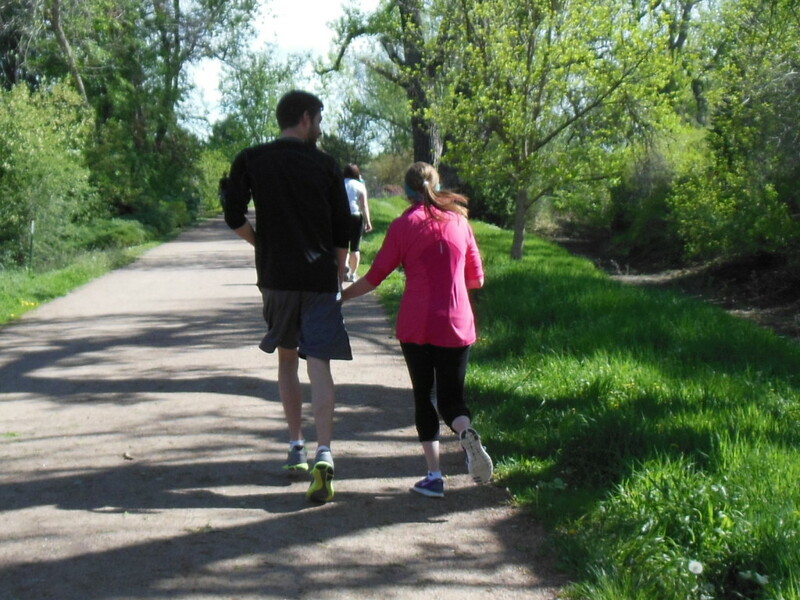 It turns out they were running the 5K, too, but neither of us knew until we got there. How cool is that? Becky is a runner/mom friend I’ve blogged about before. (See Iron Skillet Moms and Thelma and Louise Plus Five Kids.) Becky’s youngest son is my son’s best friend. They ended up running the whole thing together, which made it even better. It was their first 5K for both of them. Our two families ran the whole thing together and everyone finished within a minute of each of other. (We all came in around 37 minutes.) I was pleasantly surprised at how much all the kids actually ran. I expected to be walking a lot more of it. Afterward we stuck around and enjoyed a pancake breakfast together. It was a beautiful, sunny morning (unlike today) and we had a blast. My kids even told me they want to do another 5K with me soon. Yay! More future runners in the family! 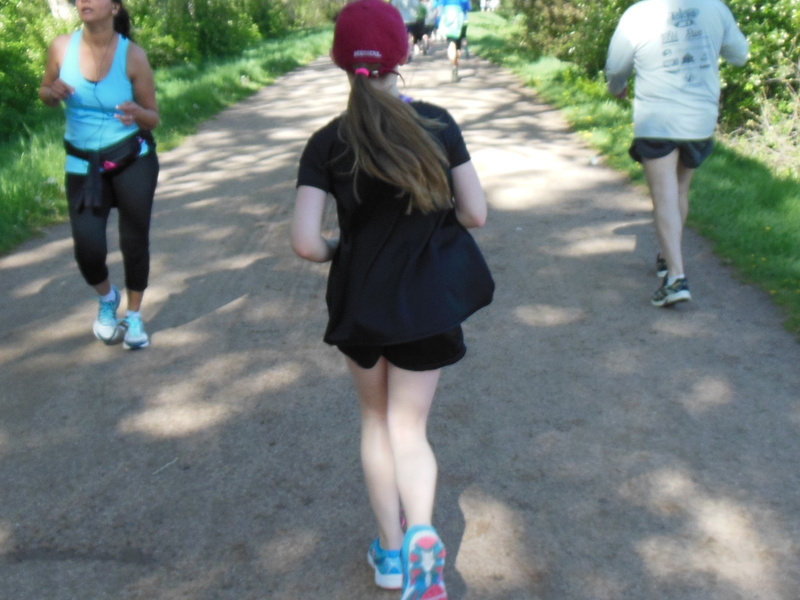 The other thing that I thought was so cool about this experience was showing my kids how healthy running can be for everyone. When you get into long distance running, it’s easy to forget that the 5K and 10K are really the backbone for everything else and these shorter races are how most of us got started. I loved talking to my kids and pointing out to them how so many different kinds of people were out with us — in all kinds of shapes and sizes and from all walks of life. I mean really, you see a lot of people out when you run a 5K — moms, dads, kids, parents pushing strollers, people with dogs, people getting in shape, uber-fit people running fast (like this one woman I spotted wearing the same Boston Marathon shirt from the year I did it), couples running together, people running slower, people walking it. It really is pretty cool when you think about it and it’s so inspiring to see so many people getting fit together. I just love that. This is exactly what I mean about how great a local 5K can be. I snapped this shot of a young couple holding hands near the end. If I had to guess, I think it was her first 5K. He was talking her through it and helping her finish. 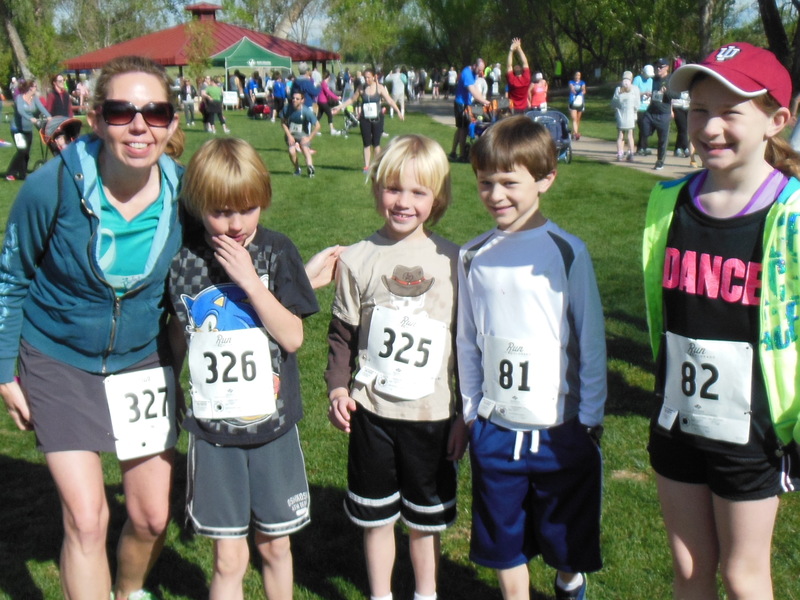 I can’t wait to do another race with my kids. I don’t know if they will ever take to it — all the running and racing and long distances — as I have but that’s OK. They don’t have to. I just hope they run and have a ton of fun along the way. “Aging is inevitable but growing old is a choice. Lace up your shoes and let’s go!